JCS – Liquid Dosing System with Vacuum Feeders – Hypo & Bisulfite Feed – Alternative to gas & pump systems | JCI Industries Inc.
JCS Industries Liquid Dosing System he system is comprised of an automatic vacuum injector to safely introduce the liquid into the feed-water stream for operations that require high efficiency, accuracy, control and safety. The system will feed numerous aqueous chemicals commonly used in municipal and industrial water treatment systems, i.e, sodium hypochlorite, sodium bisulfate, aluminum sulfate, ammonium sulfate, acids, sodium hydroxide, non-oxidizing biocides, scale and corrosion inhibitors. The system is comprised of a vacuum injector to safely introduce the liquid into the feed-water stream: a reversing servo motor coupled with a V-notch valve to regulate the chemical feed rate; an electronic flow sensor to monitor and regulate the feed rate; and a control module for complete electronic control and communications. A plant’s water flow rate and/or a chemical residual signal are used to adjust the chemical liquid flow rate by electronically positioning the servomotor driving the feed control valve. The ratio of input signal to liquid flow is adjustable over a range of 5% to 400% to enable increased liquid feed in response to additional chemical demand. The feeder will automatically regulate in both fixed and variable control modes, including fixed feed rate, flow paced, residual control, and compound loop. 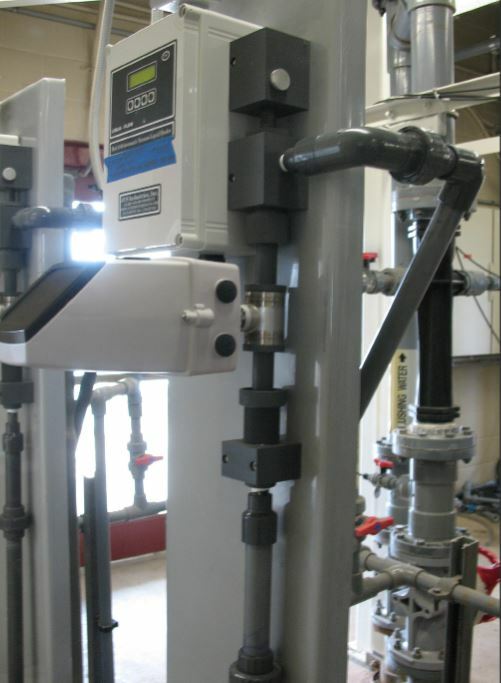 The feeder system can dose a variety of aqueous chemicals commonly used in municipal and industrial water treatment systems and can have remote start/stop control and has 2.5 hour battery backup.